Late president 'opens' innovation conference in Tel Aviv. Via special technology, Peres presented reading will he wrote before his death. The Prime Minister's Conference for Innovation opens today, Thursday, in Tel Aviv. The conference, which discusses the innovations necessary to create a better world, as well as Israel's contribution to future solutions and developments, sees the participation of some 1,000 guests from around the world, including political leaders and senior officials from leading companies. 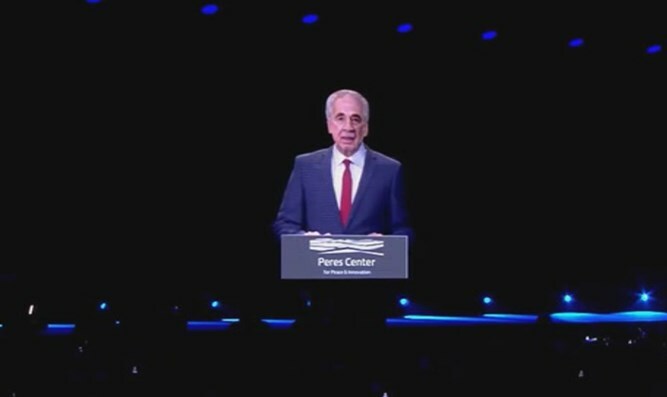 The conference was initiated by the Culture and Sport Ministry, in coordination with the Peres Center for Peace and Innovation, in honor of 70 years of Israeli tradition and innovation..
At the opening of the conference, a hologram was broadcast featuring the voice and likeness of the late Israeli President Shimon Peres, in which he “announced” his will for the Israel Center for Innovation, launched at the conference. "My vision for the Israeli innovation center established here within the Peres Center for Peace and Innovation is to serve as a window to the future. A place for dreams, a place that expresses the desire to leave the next generation with a better and brighter future," the Peres hologram said. "The future is made of the dreams of today. We must continue to work on developing the vision of tomorrow, not simply remembering the past. We have the power to create change and opportunity to have an impact." Dozens of delegations from around the world arrived for the conference. Countries sending delegations included: China, the US, Italy, France, Australia, Britain, Korea, Mexico, Switzerland, Uganda, Singapore, Russia, Hong Kong, Peru, Germany, and others. The delegations are expected to discuss the innovations necessary to create a better world, as well as Israel's contribution to future solutions and developments. Israel's groundbreaking technological inventions will be presented at the conference, as well as the country's contribution to innovations which aid the management of health, food, agriculture, sustainability, and cyber challenges.